Honda has taken a more patient approach to self-driving tech. The carmaker hasn't jumped into the fray quite as quickly as other manufacturers, but in the past year has begun to pull back the curtain on its two-pronged autonomous vehicle strategy. On the consumer side, the company announced a $2 billion investment and exclusive collaboration with GM's Cruise last October on an autonomous vehicle. On the other side is Honda's Powersports group, which builds ATVs, motorcycles, and off-road vehicles. At last year's CES, the manufactuter unveiled the prototype Honda Autonomous Work Vehicle (AWV) -- essentially a rugged four-wheel-drive blank canvas that can be programmed for various off-road self-driving tasks. At CES 2019, Honda is showing off how it has deployed its AWV over the past year, from search and rescue and fighting forest fires to agriculture, solar panel maintenance, and even snow plowing. We spoke to Pete Wendt, senior planner in Advanced Product Planning for Honda R&D Americas, about the Autonomous Work Vehicle's development and testing, and what comes next for the rugged self-driving prototype. Wendt, who works in the Powersports group, stressed that the project is completely separate from the auto autonomous side of the company, but that the two teams do share expertise and research. That said, the autonomous software challenges are a lot different. Self-driving cars are traveling at higher speeds and object detection is focused on what a driver would see on the roads, whereas off-road challenges could mean training the autonomous system to deal with all manner of natural obstacles. "One of the craziest use cases we came across were ranchers in Australia herding cattle," said Wendt. "They were using two guys on off-road motorcycles, a dog, a helicopter, and a few people on horseback. Now think about a fleet of 20 autonomous work vehicles that would know if a few cows branched off, let's say two vehicles would start honking to drive them back into the herd." The AWV has different autonomous modes depending on the deployment situation. "Follow Me," for instance, is designed for firefighters fighting forest fires and wildfires to help carry gear. Honda has been testing the AWVs with a wildland firefighting division in Colorado. The autonomous vehicle would be loaded up with the 60-70 pounds of gear, including water, that firefighters would otherwise have to carry with them as they respond as quickly as possible to a situation. The vehicle simply follows them and does the heavy lifting. 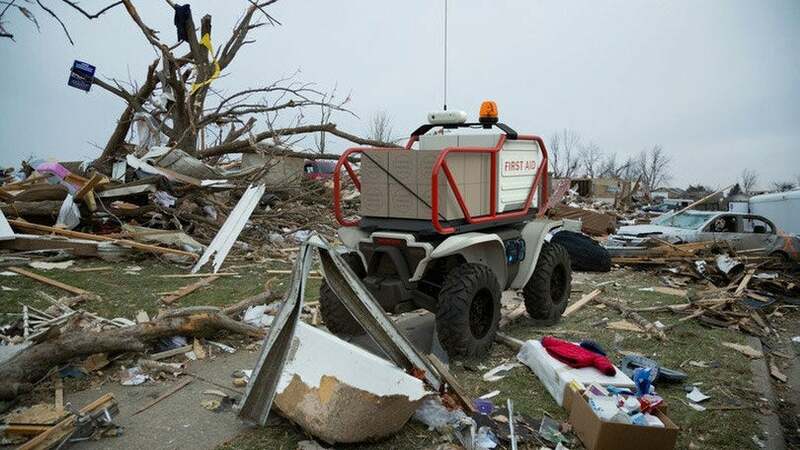 This mode is also key for search and rescue or emergency response situations, where the AWV can be sent into more dangerous situations or treacherous terrain. "Search and rescue teams have to drive somebody up a truck to the highest mountain areas or down into mines with comms equipment in the truck," said Wendt. "That person sitting in the truck could instead be used to search. As we get more comfortable with the technology and it gets more powerful, it'll be amazing to see how it can be helpful." Other modes -- including "Pattern" and "A to B" -- are more suited to farming and agriculture situations, Wendt explained. The autonomous vehicles can be trained on patterns for spreading fertilizer, for instance, or picking fruits and vegetables during a harvest season where there's a greater demand for manpower in the fields. Another interesting use case Honda has explored along these lines is solar panel maintenance, which Honda has been testing with a large-scale solar operations company in North Carolina. "This was one we never expected. The [solar company] contacted us and explained that they have weeds growing in vast solar fields that span hilly areas with mud and rocks and rough terrain," said Wendt. "They tried goats, but the goats ate the electrical wires. Then they tried sheep, but the sheep wouldn't eat some of the weeds. So the vehicles drive up and down the roads and cut down weeds. We're now talking about equipping them with sensors to scan the panels for damage or dead spots, even perhaps with a thermal imagery sensor to look for hotspots." This kind of large-scale agricultural and operations automation is one big potential use for these kinds of business-focused autonomous vehicles. It's still early days for Honda, but Wendt said it's hoping to meet potential partners at CES that can start building out an ecosystem. "The idea is that if and when we launch, [the vehicle] will come with a variety of accessories, from simple things like a dump bed to more advanced accessories like a pesticide or fertilizer sprayer," said Wendt. "As the technology evolves, we'll add more accessories, and third-party suppliers and partners can create their own specialized attachments for this low-cost platform. We might not have the expertise to create a robotic arm, for instance. "What made the iPhone so great wasn't the phone; it was the apps. Most of those were developed by third parties," said Wendt. The AWV is still in developmental stages, so Honda declined to provide launch timing or pricing.